Forever Stock - Custom Cap Professional Model Heavy Duty. 100-Percent Stainless Steel. Fits over 90-Percent of all chimneys while costing 60-Percent less when compared to ordering a custom made chimney cap. Protects the entire chimney crown and flue from deterioration. Removable hood for easy cleaning. Knock-down design saves on shipping costs. Standard 10" screen height. Superior 3/4" animal proof oval hole mesh that helps prevents creosote build up. Wide 1 1/2" flange for easy installation. For the correct size measure the overall chimney crown size length and width. Than subtract 3" from the length and width to get the correct screen to screen size. Please Note: The highest flue on your chimney MUST BE 5" or less for this type of chimney cap to maintain proper drafting. 24 gauge hood. 22 gauge base and mount flange. The Forever Cap. "Nothing Else Even Comes Close". Screen to Screen Size is 17" x 17"
Hood size is 24"x 24"
If you have any questions about this product by The Forever Cap, contact us by completing and submitting the form below. If you are looking for a specif part number, please include it with your message. 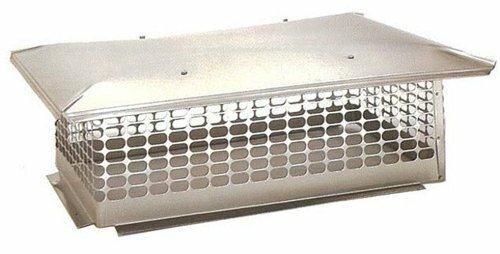 Stanbroil Stainless Steel Venting Panel for Grill Accessory, 15" by 4-1/2"